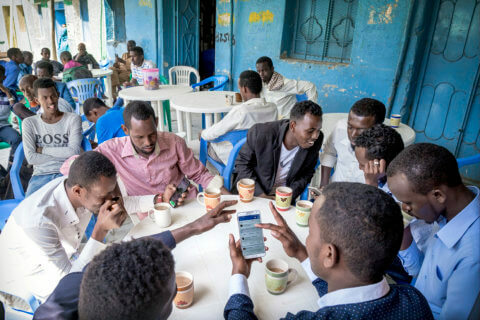 People gathered in a cafe where they drink tea and coffee and use and discuss social media communications with friend and family who have gone abroad. In this policy brief, ARTICLE 19 examines the compliance of dominant social media platforms – Facebook, Twitter, and YouTube (owned by Google) – with international freedom of expression standards; and gives practical recommendations on what companies should do to demonstrate their commitment to protecting of freedom of expression. Social media companies have become fundamental to how we communicate. According to recent estimates, there are currently 2.2 billion active Facebook users and 330 million Twitter users worldwide. While social media companies have had a positive effect on freedom of expression, they have also come to hold enormous power over what information we can access. Contrary to the common perception that ‘anything goes online’, sharing information on social media platforms is not free from control. When users join Facebook, Twitter or YouTube, they agree to the companies’ Terms of Service, which determine the types of content the respective company deems acceptable or not. Social media users who fall foul of these standards can see their content removed or their account disabled altogether. Furthermore, social media platforms are finding themselves under constant pressure from governments to remove content deemed harmful or illegal under respective national laws. Online censorship is therefore increasingly privatised, raising serious questions for the protection of freedom of expression online. In this policy brief, ARTICLE 19 puts forward that although social media companies are in principle free to restrict content on the basis of freedom of contract, they should respect human rights, including the rights to freedom of expression, privacy and due process. The policy sets out the applicable standards for the protection of freedom of expression online, particularly as they relate to social media companies, and lays down the key issues at stake from regulation of speech by contract. It provides analysis of selected Terms of Service of Google, Facebook, Twitter and Youtube and examines various policy options available to regulate social media platforms. Finally, ARTICLE 19 makes recommendations for how companies should respect basic human rights standards. States should provide for a right to an effective remedy for violations of freedom of expression by social media companies. Individuals should be given the opportunity to appeal to a court or other independent body. Companies should resist government and court orders in breach of international standards on freedom of expression or privacy, this includes individual legal requests where lacking legal basis;. Companies should publish comprehensive transparency reports, including detailed information about content removal requests received and actioned on the basis of their Terms of Service. Additional information should also be provided in relation to appeals processes, including the number of appeals received and their outcome.